McLaren Special Operations (MSO) has been one of the busiest departments at the British supercar firm since . 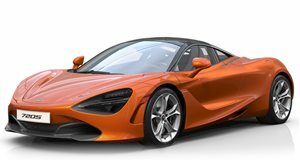 According to the company, MSO has had a hand in nearly every single 720S that's rolled out of Woking, a testament to its customers' want for unique, bespoke creations. To celebrate that success, McLaren brought a commissioned MSO 720S to this year's show wearing a deep-as-the-ocean Atlantic Blue exterior finish. This 720S is the second MSO customized example its brought to Geneva. When McLaren revealed the model last year, the company also revealed ',' the very first MSO 720S. That car, which was meant to highlight the ultimate performance of McLaren's new 720, wore a two-tone Volcano Red and Nerello Red exterior finish and was given a red-on-black interior. If you'd like your own 720S, McLaren's next available built slot is in July. Some 1,500 examples of the 710-hp 4.0-litre twin-turbocharged supercar have already been built.